Woman’s Court Costume: Silk with gold and silver braid and pompoms. Lucknow, C.1830-40. This extravagant costume would have been worn by a dancer or noblewoman at the flamboyant Lucknow Court, although the fashion for exaggeratedly wide trousers like these worn under a full, shorter overdress was popular in several centres of North India during the first half of the 19th century. Women wearing such costumes are shown in Lucknow paintings of the 19th century and in Company style paintings from other centres in North India. 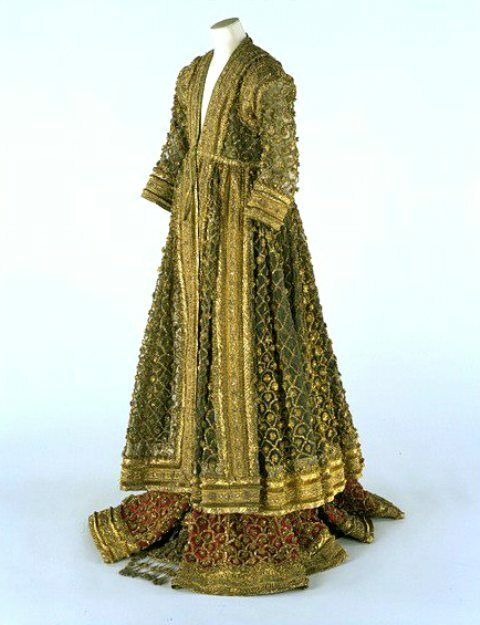 Traditionally reputed to have belonged to the ‘Queen of Oudh’, this outfit is more likely to have been worn by a very young girl for a betrothal ceremony, or even created specifically for an exhibition such as the Exposition Universelle in Paris in 1855, from which it was acquired by the India Museum in London. A pair of women’s embroidered trousers with very wide legs. Each leg is made up of 17 triangular panels and one rectangular panel. The fabric is of thin silk with applied gold ribbon (gota) and gold pompoms. Man’s robe of white cotton, with repeating staggered pattern of embroidered floral motifs in gold-wrapped thread and floss silk. 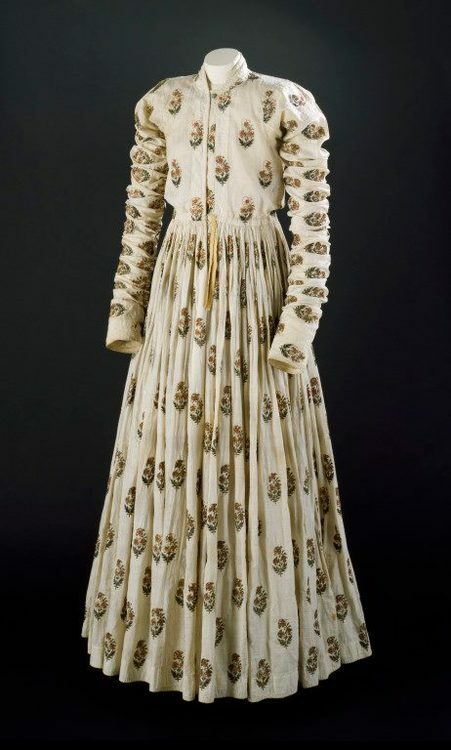 Long sleeves, front opening, floor-length gathered skirt – 18th century, India. This elegant robe would have been worn by a man at one of the courts of northern India. The floor-length gathered skirt was popular in the 18th century, in contrast to the shorter robes of the previous century. The staggered floral design is typical of late Mughal design, and is often seen printed on textiles, as well as embroidered as in this example. Other examples at this post. This entry was posted in 1800s, 19th century, Costume, Vintage and tagged Costume, dress, gold white, historical costume, Mughal, red, tunic, vintage, wide trousers. Bookmark the permalink. I’m contacting you on behalf of Discovery Channel, we are a production house based in Delhi and are in the process of making a documentary commissioned by Discovery Channel on a historical monument, part of the documentary consists of recreations from a historical era for which we require Mughal jewellery and attire. We were hoping to establish contact with you so as you can guide us from where can we source authentic Mughal wear. Please let us know how to take this forward. Hi Naam thank you for getting in touch. I can’t source authentic Mughal wear. I only use images for my research not actual materials.